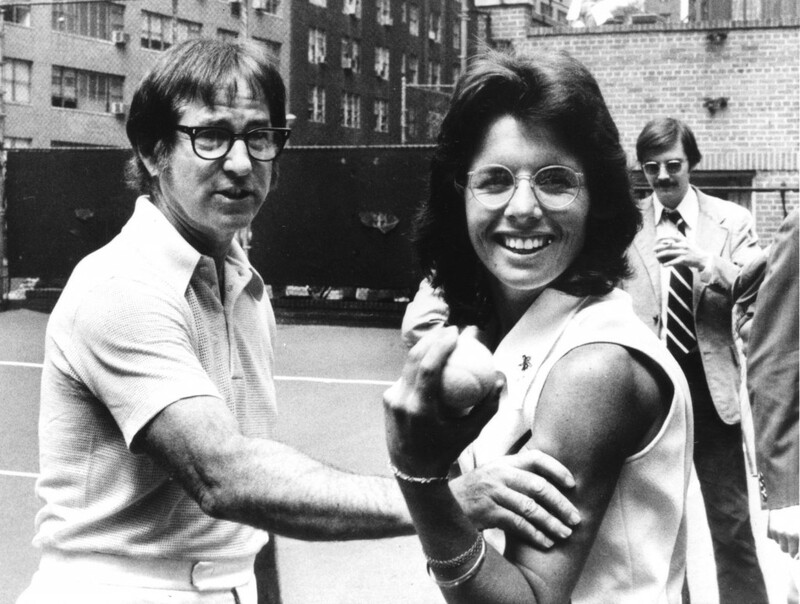 This day marks the 40th year anniversary of the legendary “Battle of the Sexes” tennis match between the late Bobby Riggs and Billie Jean King on September 20th, 1973. King is renowned not only for her win in that match and her long career as a tennis pro, but also as a lifelong champion of women’s rights. Earlier this month, PBS aired an episode of American Masters focusing on the famous sports star and activist. While King’s victory over Riggs on the tennis court was a memorable and momentous event on the world stage, this year also marks the fortieth anniversary of the formation of the Women’s Tennis Association, and of women earning equal prize money at the U.S. Open. 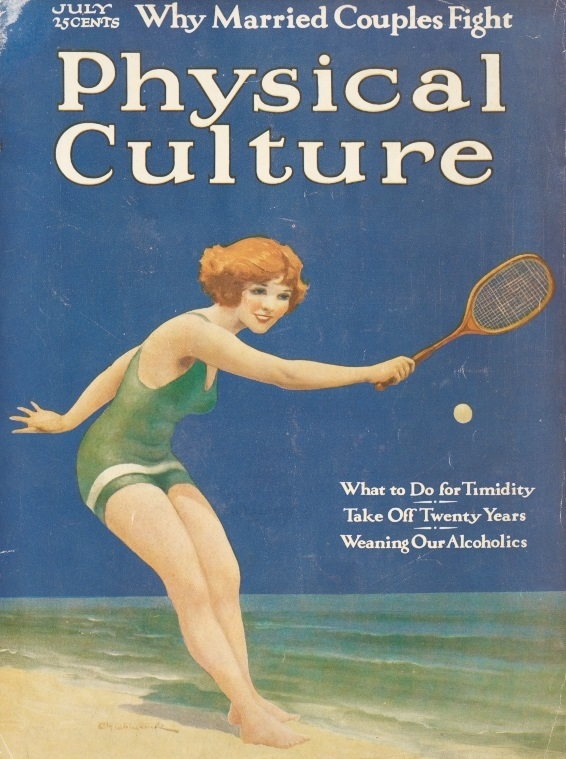 To celebrate Ms. King’s role in insisting on gender equality on the playing field, I thought that I would post some images from the cover of publishing magnate Bernarr Macfadden’s Physical Culture magazine. 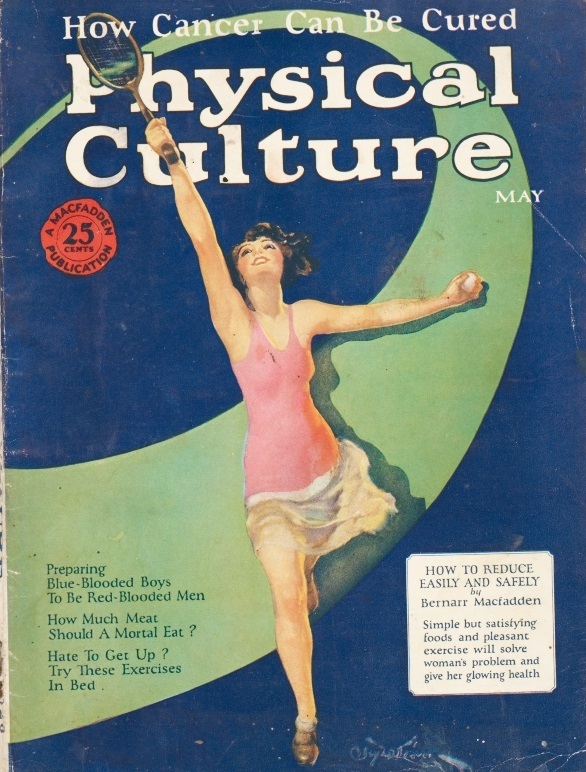 A strong advocate of physical exercise for men and women alike, Macfadden packaged his popular periodical with cover illustrations that glorified the athletic female form. 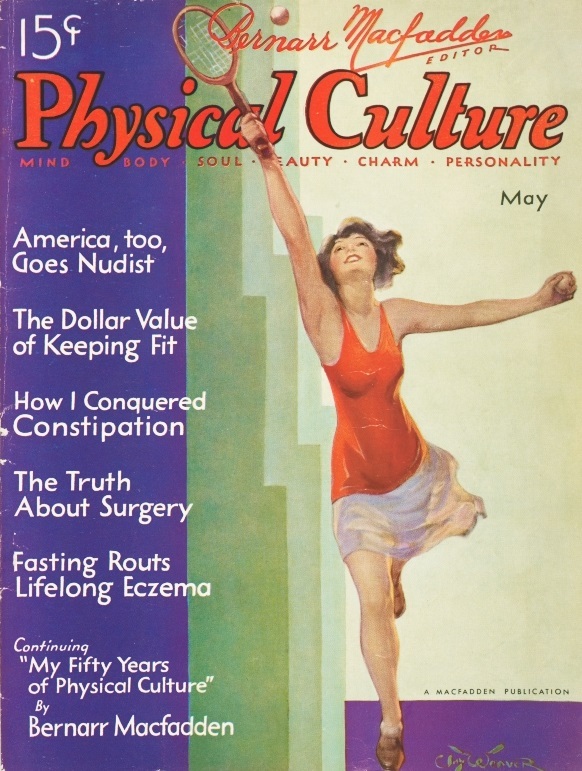 The bulk of our holdings of this magazine came to us as a donation from Robert J. Young (1928-2009) a life-long advocate of healthy living through sunbathing, physical exercise, and healthy eating habits. 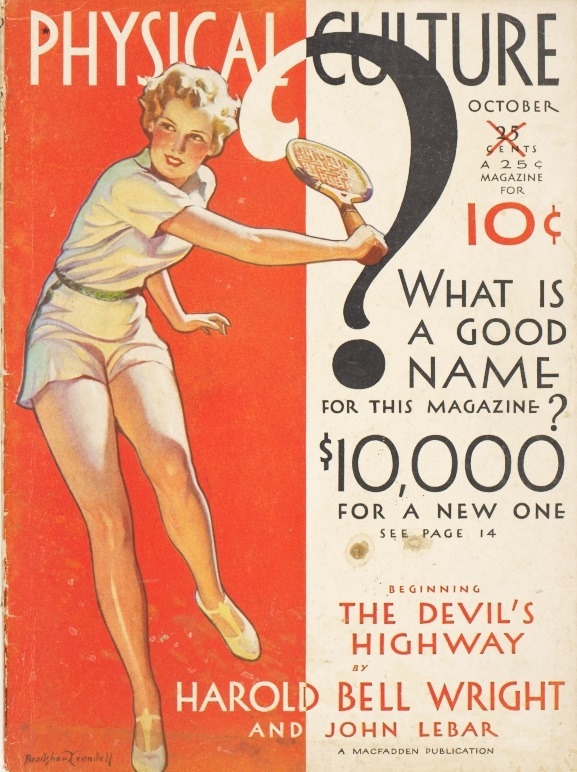 I have included below just those covers that depict women playing tennis in the decades prior to Billie Jean King’s famous match. Recently ESPN published an article citing an informant, Hal Shaw, who came forward after forty years of silence to allege that Riggs had rigged the outcome of the legendary match. Just months before the game, the country club worker claimed to have overheard Riggs conspiring with mobster friends to throw the game, allegedly to pay off the large gambling debts of the “Happy Hustler” and notorious male chauvinist. Others have cited Riggs’ lack of training and preparation for the challenge as further evidence of a “fix,” but arrogance and overconfidence were just as much a part of Rigg’s character flaws as was his propensity for gambling. I am not a gambling man myself, but if I had to bet on the one possibility or the other, I would not hesitate to lay odds on that fifty-five year old Riggs was fairly and easily trounced by the twenty-nine year old King. 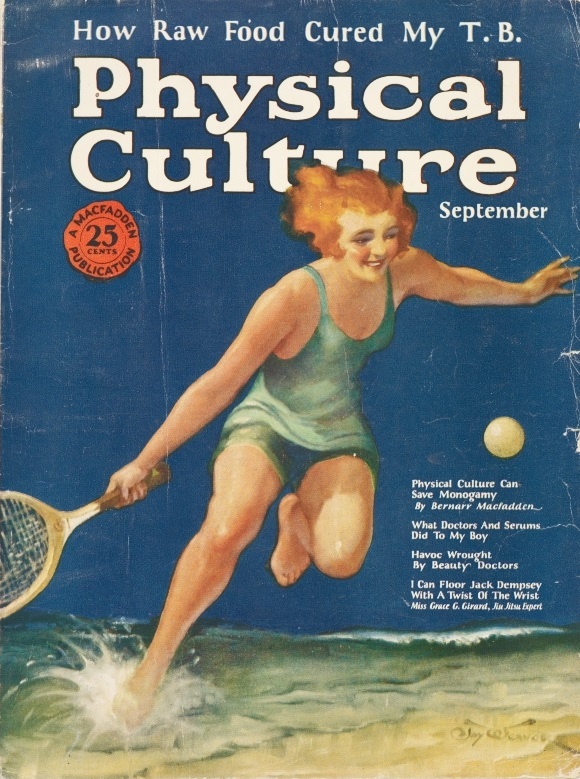 Either way, for her lifelong service to the fight for gender equality in sports, King remains the Queen of the Court in my book, while perhaps the first and last article titles on this last issue of Physical Culture best capture Riggs’ legacy. Anyone interested in women and their participation in sports in the 1920s and 1930s should plan on visiting the Wolfsonian to see our exhibit, Women in Motion: Fitness, Sport, and the Female Figure, on view until September 29th. ~ by "The Chief" on September 20, 2013.